Easy, Efficient and Professional, StreamSend email marketing platform provides hundreds of free stock images, templates and an easy to use template editor. No graphic skills needed to get started. Take advantage of their 30 day free trial to check StreamSend for yourself! Boost Your Email Marketing Campaign With Ease! StreamSend is a user-friendly, inexpensive and solid email marketing solution, developed to help businesses make the most of their email marketing campaigns. Focused on developing polished technological solutions to cater to the communications needs of users, StreamSend operates on the motto of: Easy, Efficient and Professional. With StreamSend it is easy to create a professional looking email template, and send it off to your subscriber list in no time. In addition, StreamSend assigns dedicated IP addresses to its users, as part of the standard offering. With hundreds of optimized and professionally designed templates, StreamSend ensures perfect rendition across all screens, from computers to mobile devices. You may choose to use one of StreamSend templates or upload and convert your own images and designs effortlessly with the drag-and-drop editor. Template Selection – The user-friendly drag and drop editor allows you to update hundreds of polished, pre-designed templates with new images, videos, RSS feeds and surveys. Plus, StreamSend offers a huge selection in free stock photos. 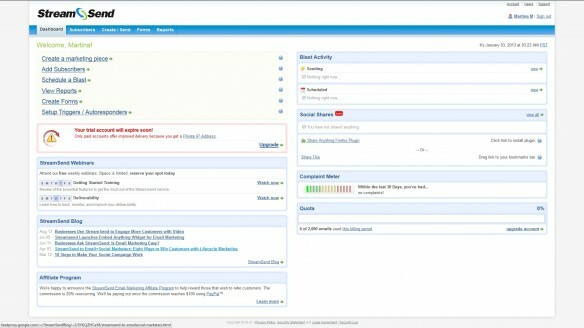 Customization – Editing the templates takes only a few minutes if your text has been completed beforehand. Not all templates on offer have photos or colors. Some have just text and email blocks to help get you started. If you need to send out emails in a rush, this option can come handy. Multimedia – We were pleasantly surprised by the free image storage space and the hundreds of stock photos available. If you want to add a photo as you progress, use the option from inside the template editor to search for keywords; then, just drag & drop photos into the template. The interface on the StreamSend editor is so easy to use that the lack of tutorials in the platform will not come as a massive loss. With the drag-and-drop tool, you will be able to easily build templates, using images, videos and text boxes almost effortlessly. The template editor’s drawback is that you cannot add social sharing buttons or additional content boxes from within the template editor. This is a basic and simple email creator that works, despite its limitations. 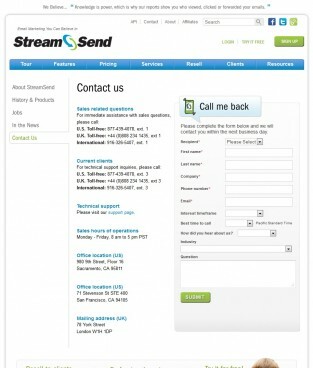 StreamSend offers three telephone numbers to reach them locally or from abroad. Their FAQ section is weak and there are no forums, webinars or video tutorials on offer. This is a very simple platform to figure out. However, if you have questions or would like to expand your knowledge, you might have to stay on hold until your call is attended. Get a feel for StreamSend with the free 30-day trial, allowing you to access all features and send up to 2,000 emails! After the free trial, you can choose a monthly package, based on how many emails you will be sending per month. The smallest package starts at less than $20 for 2,000 subscribers, on an upward scale up to 50,000 subscribers or more. All packages are fully featured. If you plan to be sending more than 50,000 emails monthly, you may benefit from StreamSend’s specialized solutions for enterprise and franchise businesses as well as global agencies with customers in multiple countries. Rich in features, StreamSend makes it easy to integrate email, social, and video campaigns quickly and expertly. Try StreamSend free for 30 days and tell us about your experience!